The average cost of memory care in Palm Beach County is $4,217 per month. This is lower than the national median of $4,650. Cheaper nearby regions include Broward County with an average starting cost of $4,005. To help you with your search, browse the 55 reviews below for memory care facilities in Palm Beach County. On average, consumers rate memory care in Palm Beach County 4.4 out of 5 stars. Better rated regions include Broward County with an average rating of 4.4 out of 5 stars. Caring.com has helped 23 families in Palm Beach County find high-quality senior care. To speak with one of our Family Advisors about memory care options and costs in Palm Beach County, call (855) 863-8283. $500 off our one bedroom apartments! Get a one bedroom for just about our studio prices! More than 540,000 Florida seniors live with Alzheimer's disease, according to the Alzheimer's Association, and that number is projected to grow. Palm Beach County boasts a large senior population where more than 23 percent of its 1.47 million residents are aged 65 and older. Palm Beach County seniors living with Alzheimer's disease and related memory disorders can choose from 42 memory care facilities in the area. 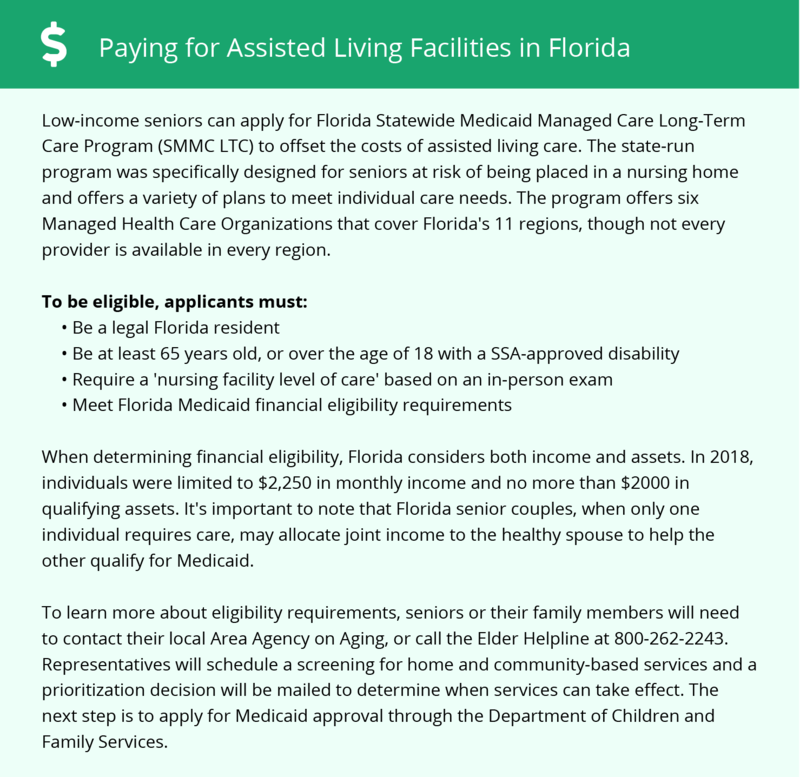 These memory care facilities, which are a type of assisted living facility, must meet licensing requirements established by the Florida Department of Elder Affairs. Additionally, memory care facility staff must undergo training established by the University of South Florida's Training Academy on Aging. Seniors' families can trust that these facilities are well equipped to care for their loved ones with dementia. Palm Beach County's cost of living is high. On a scale where 100 represents the national average, Palm Beach County ranks 268.3. Housing costs are especially high, but healthcare costs come in below the national average at 96. Seniors' families may want to consider the impact of this cost of living on their budget. Palm Beach County seniors may enjoy some savings thanks to Florida's tax laws. The state doesn't have an income tax, which means social security income isn't taxed, either. This may result in some monthly savings for seniors. Seniors and their families looking for warm weather will appreciate the area's climate. Palm Beach County enjoys warm year-round temperatures, with winter lows hitting just the upper 50s. Summer temperatures rise to the upper 80s. Palm Beach County sees no snow, more rain than average and more sunny days than average as well. Palm Beach County is home to world-class medical facilities, including those specializing in brain health and dementia care, such as the Palm Beach Neuroscience Institute, in the event of medical emergencies or illness. Memory Care costs in Palm Beach County start around $4,217 per month on average, while the nationwide average cost of memory care is $4,799 per month. It’s important to note that memory care rates in Palm Beach County and the surrounding suburbs can vary widely based on factors such as location, the level of care needed, apartment size and the types of amenities offered at each community. Palm Beach County and the surrounding area are home to numerous government agencies and non-profit organizations offering help for seniors searching for or currently residing in an assisted living community. These organizations can also provide assistance in a number of other eldercare services such as geriatric care management, elder law advice, estate planning, finding home care and health and wellness programs. To see a list of free memory care resources in Palm Beach County, please visit our Assisted Living in Florida page. Palm Beach County-area assisted living communities must adhere to the comprehensive set of state laws and regulations that all assisted living communities in Florida are required to follow. Visit our Memory Care in Florida page for more information about these laws.